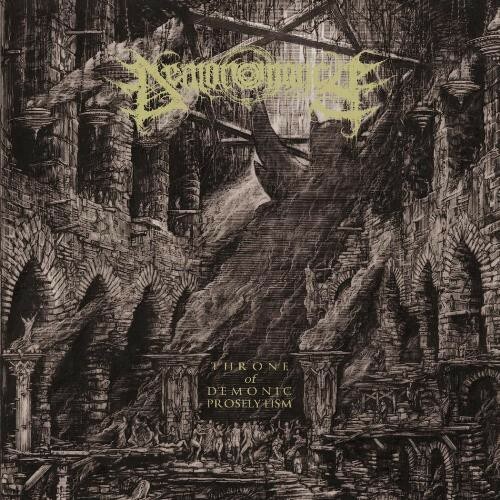 After emerging on the scene with the “Bearers of Black Arts” demo followed by the “Rites of Barbaric Demons” mLP and last year’s “The Premonition” demo, Italy’s Demonomancy now return with one of the most anticipated debut full-lengths released in years. With this album, entitled “Throne of Demonic Proselytism,” Demonomancy settles into its sound focusing on a style that draws upon the dark, mid-paced atmosphere of bands like Demoncy and Archgoat, but delivered with the cutting precision of the first Black Witchery album. In contrast to many of the more “Bestial” Black Metal bands, Demonomancy do not seek to exploit cacophony and chaos; rather, the band reins in these forces in service of something more advanced. Their delivery is measured, even, and deliberate. The tension produced by the collision of the restrained violence balanced uneasily above the swirling and frenetic emanations of abyssic fury is arresting. Indeed, it is this exalted sense of controlled chaos that distinguishes Demonomancy. This album is further distinguished from the band’s previous efforts by the addition of exclusive artwork by Zbigniew M. Bielak with layout executed by TLLMN.